Open please this link of “A Blessed Call to Love” and read the third text (below) on Bld Alexandrina. A new website in English on Bld Alexandrina is being prepared. It’s dedicated to Francis Reynolds, the founder of Alexandrina Society. There are many, many devotees in the world that can only access information about our Beata if it is in English. Therefore has been made a great effort to get translations, but it is not enough what is done. I promise you – trust Me - that after your death all the souls that visit your tomb will be saved, so long as they do not continue in sin and thus abuse the great favour I give them because of you. In order for those who visit your tomb be saved, other graces are needed, but those graces will be given to them by you. "You are queen of sinners, you are queen of the world"
At the same time my Heavenly Mother came on my right side and took me into Her arms. She asked me for courage on behalf of Her divine Son. - Cheer up, my daughter, cheer up, I beg you on behalf of my love, and of yours, and of my Jesus. Accept, suffer everything, comfort His divine heart wounded by the sins of the world. Look, dear daughter, I come to confirm the words of my divine Son. You are queen of sinners, you are queen of the world. Accept my holy Mantle, it is yours, stand in my place. Wrap yourself in it, put around you those who you love and who most closely share your pain. Those who share it, and care for the cause of my loved Jesus are dear to your heart, and to mine, and to that of my blessed Son. Those who we most closely associate with your suffering are those who we want to purify. Later wrap all sinners in it. You can cover the whole world with my Mantle; there is enough room for everyone. Accept my crown, you are crowned by Me: you are queen. My God, how humbled I felt! How small I was, how insignificant next to our Heavenly Mother! How embarrassed I felt when she placed Her holy Mantle on my shoulders, and a crown on my head, the queenly crown which She took from Her most holy head to put on mine. Heavenly Mother, Heavenly Mother, what shame I have before You and Jesus! I am not worthy of such things. Oh, how great my misery! - Courage, daughter, do not be ashamed. You are purified by the suffering and by the Blood of your Jesus which have cleansed everything; you are as white as ermine. The brightness of your purity and of your virtues illuminates the world, your perfume radiates around it. Fill yourself, receive love. It is mine; it is of Jesus. The love, affection and caresses you receive from Us attract souls to you. Give everything to those who you love in our name. Fill yourself to save the world. Fill yourself, it's yours, it belongs to you, save it. Our Heavenly Mother and Jesus flooded me with love and after Their tender caresses, they departed. I was more alive and more joyful. - I love Jesus and our Heavenly Mother, I want what They want! 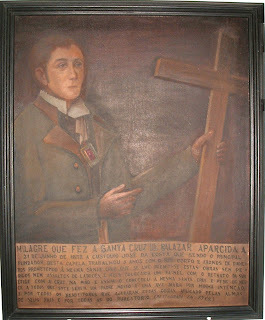 Promotion of devotion to the Holy Cross de Balasar must be credited to Custódio José da Costa, a native of the parish. He took very seriously the fact that it was he himself who had first seen the Cross. Let’s see what he wrote at the beginning of his report. Among the numerous devotees of the Holy Cross, a son of Balasar stands out for the zeal and sacrifice he manifested in favour of the new devotion. This good man, and fervent Catholic, was born in Balasar in the year 1788, the son of humble but hard-working parents. In 1803 he decided to leave his native land and embark for Brazil, which he did, to try to make his fortune. There, after much labour, and having acquired reasonable wealth, he decided to return, which he had done before the appearance of the Holy Cross. 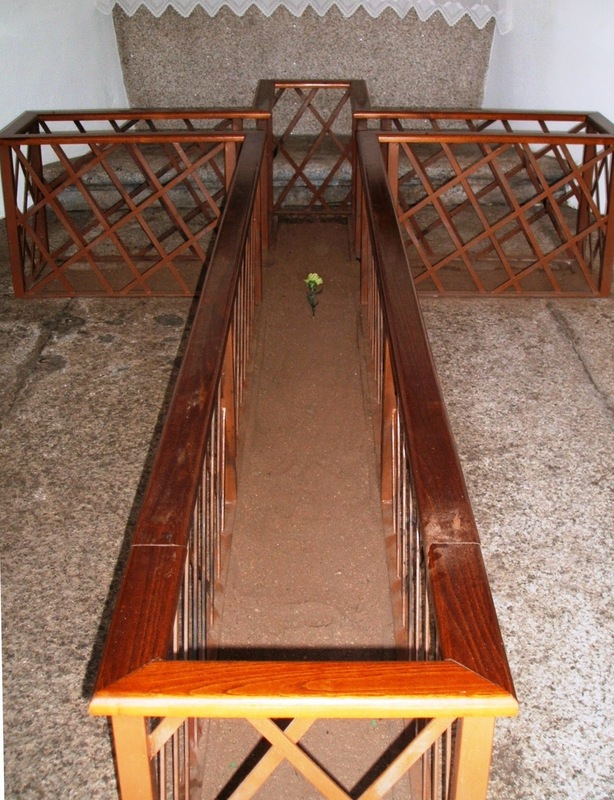 Custódio José da Costa, whose effigy is conserved in an oil painting in the small chapel, was a witness of the surprising appearance that not only moved the people of Balasar but also believers of the neighbouring parishes, who came in great number to visit the Holy Cross of Jesus Christ and to pray, decided to undertake the erection of a chapel where there could be more respect and devotion for the symbol of the Redemption. According to note left by this exemplary parishioner, he spent the amount of 1.790.120 réis on the patrimony and the works of the chapel, as well as on the acts of the cult, over 17 years, an expense in which he was assisted by the alms of the generous people who made their promises to the Holy Cross. This good son of Balasar was a great caretaker and benefactor of the new chapel; however he was not free of the spiteful tongues of detractors, who also alleged that he was not only motivated by devotion but also by self-interest. Custódio José da Costa, aggravated by the ingratitude and perversity of some of his countrymen, delivered the management of the chapel and its patrimony to the Parish Council. But the members of the Council, more politicians than devotees, left everything to go to seed, not caring about the devotions of the cult, terminating the daily Mass that Custódio José da Costa had arranged to be celebrated there for the devotees and benefactors, and disparaging as extravagant the annual feast which was held on the feast of Corpus Christi, the anniversary of the celebrated appearance of the Cross. It is not so surprising that on 21st June 1832, in the place called Calvary, in the Parish of Saint Eulália of Balasar, Municipality of Póvoa de Varzim, the earth of the land formed itself into the shape of a Cross, because that earth is the land of Portugal, a privileged Kingdom. That this appearance invited worshipers who agreed to observe the prodigies of the Altar of our redemption and to venerate that Sacred Symbol, is not extraordinary, for being Portugal Catholics they are of one accord, but, indeed, it is out of the ordinary that along with this holy phenomenon the same parish produced Custódio José da Costa, so devoted and pious who, seeing that symbol of the adorable, built, at his own cost, a little chapel in that place, in order to prevent some accidental irreverence; and, not being able to contain his zeal, built a Cross with the Image of J.C. and, when it had been blessed, erected it in the place where the Cross appeared, already sacred ground. 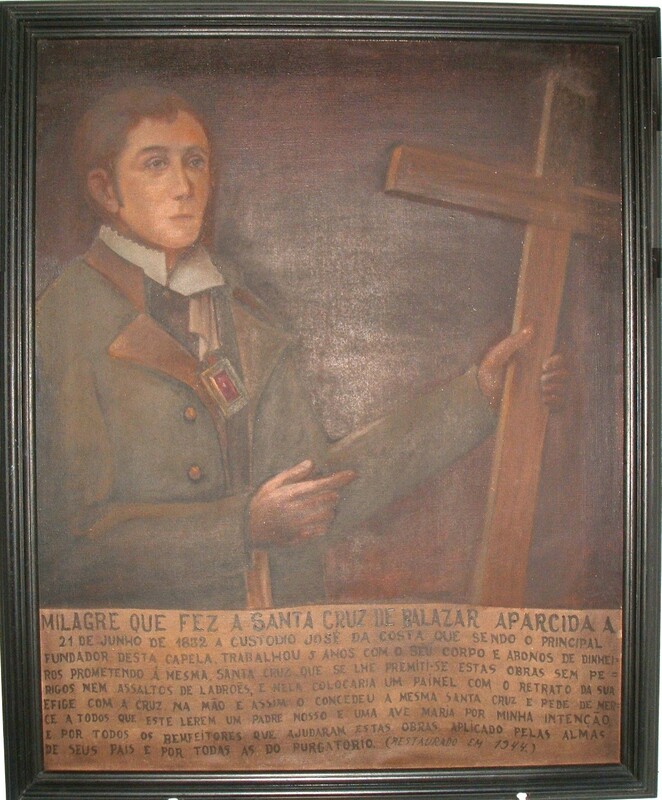 There, as from a fountain of graces, the faithful obtained the favours they asked for and so many are the approbations and visits of gratitude that not only was the foundation of the Lord’s House of the Cross lain but the devoted zeal of Custódio José da Costa was increased. This athlete watched over the exaltation of the Holy Cross, delivered the administration of that chapel to the Parish Council and, not content, encouraged the formation of a Brotherhood for the administration of the cult to the Sacred Tree of the Cross. In addition to this zeal, he promised an annual pension of five measures of bread, and a one-off gift of 50$000 réis for the cult. Finally he gave 28$800 réis to fund a monthly Mass for the brothers and for living and dead benefactors. On this basis he arranged the present Statutes. A well known priest in England, Fr Tim Finigan, has given the Alexandrina DVD a very good review, Kevin Rowles wrote. See here. The report on the appearance of the Holy Cross sent by the Parish Priest of Balasar to the ecclesiastical authorities of the Archdiocese is dated 6th August 1832. This date is less than two months after the event, which took place on 21st June, the feast of Corpus Christi that year. The contents of the report were later confirmed by independent reports submitted by the Parish Priests of Gondifelos and Macieira. So we are talking here about well documented facts, not hearsay or legend. It’s also to be noted that Portugal, which had already been through a long period of political disturbance, faced imminent civil war. Mindelo’s landing was on 8th July of that year, and the liberal victory of 1834 would have terrible consequences for the Church. In this context, the appearance of the cross was an incitement to faith and to hope, and this message was not lost on the people. For reasons that I am unaware of, the parish priest António José de Azevedo, author of the report, left Balasar in 1833. His successor was “banished in 1834, for reason of having agreed with the usurpation, and was reinstated in 1841”, as we are told by the priest Domingos da Soledade Silos, a staunch partisan of the new political regime. These violent upsets had been rather common; the devotee Bernadina Rosa Costa to the Holy Cross de Balsar tells it this way when referring the Touguinhó’s Parish Priest. I write to advise you of an inexplicable occurrence in this Parish of Saint Eulalia of Balasar. Last Corpus Christi, while the people coming to morning Mass were passing the road which crosses the little hill of Calvary, they noticed a cross laid out on the ground. The earth which formed this cross was of a lighter colour than the surrounding soil. Dew had fallen all around, except on the cross. I myself went to brush away the dust and loose earth that formed the cross, but the design reappeared in the same place. I then ordered a considerable quantity of water to be poured over it and on the surrounding ground. But after this had drained away, the cross reappeared once more and has remained there since. The staff of this cross measures fifteen hands and the traverse measures eight hands. On rainy days the cross can be clearly seen at any hour and during good weather the cross is perfectly visible from early morning until nine o’clock, and in the afternoon, when the Sun is sinking in the west. During the daylight hours it is not so easy to discern. As the news of the appearance of this cross began to spread people started to travel to see and to venerate it; they decorated it with flowers and left alms. It is told that some people having asked for the aid of God in their needs through it had their requests granted. Instances were reported of sick animals being healed, also animals who had been lost or stolen were recovered in ways that seemed miraculous. Some people who had suffered for years from diseases were restored to health in a few days. A woman of Apúlia parish who had a cripple finger, touched the cross with it and was suddenly healed so that she was able to move the finger with the same ease as she could move the others of the same hand. I did not witness this myself, but it was witnessed by trustworthy people, who testified to what they had seen. Devotion to the cross has become so popular that on Sundays and Holy Days people from distant areas walk here on pilgrimage to see and venerate it. When they arrive they circle it on their knees. Many leave alms before they depart and I have appointed an honest man to look after these offerings. Some of my parishioners now want to use the alms money to construct a sort of chapel at the site of the cross, to cover it with wood and also to have it surrounded with a wooden frame for protection from the elements and, inside and opposite the earth cross, to erect a wooden cross, with the Image of Crucified Jesus painted on it. I do not wish to agree to this without advising Your Excellency on the phenomenon, or to undertake the work without Your Excellency’s permission, being conscious that neither I nor the parishioners have authority to use the alms-money at will. Anyway, there are insufficient funds to construct the sort of edifice the site calls for. I would be obliged if Your Excellency would express you judgement on this matter and advise what measures I should take. Saint Eulália of Balasar, 6 August 1832. Father António José de Azevedo acted in this matter with eminent good-sense, particularly if we take into account the political climate that cast a dark shadow even over the Archdiocese: He showed neither hasty enthusiasm nor stubborn disbelief. Facts are facts, he seems to say to the archiepiscopal authority, and his pragmatic attitude still speaks to us today. The name of the Parish priest of Touguinhó mentioned above was Custódio José de Araújo Pereira and was very rich. Ten years later he would pay a new church for the parish. He must have been a very respectable man, therefore Domingos da Soledade Silos does not say anything wrong about him. It is clear that Fr Umberto also remembers the Holy Cross as we can see in the biography Blessed Alexandrina, chaps. I and V.
Therefore, Bld Alexandrina’s friends cannot ignore the history – attested and documented - of the appearance of the Holy Cross of Balasar and the cult that was born from it, indeed, studies made some time ago. During the years 1933-1935, an author who identified herself only as Z exhaustingly approached the subject in the periodical Propaganda, under the heading “Santa Cruz de Balasar”. Many years later, in 1958, Fr Leopoldino Mateus published a very similar study, but more developed, in the second number of the Cultural Bulletin of Póvoa de Varzim. Towards the end, he gives the information that the writer Francisco Gomes de Amorim, in his romance As Duas Fiandeiras, in chapters 8 the 12, reconstitutes the feast of the Holy Cross of Balasar referring to the year 1845. It is certainly a historical evocation of his youthful times, therefore trustworthy. 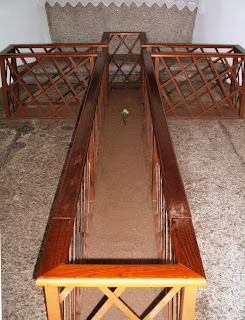 In the parochial archive of Balasar, is a copy of the process for the authorization for the creation of the Holy Cross Chapel – “Letter of civil judgement of patrimony of the Holy Cross Chapel of Jesus Christ, situated in the parish of Saint Eulália de Balasar” – which was written in the Curia of Braga. What is impressive about the document is the credibility it imposes. There are other temples with their origins involved in legends, yet here everything is duly proved. There is a local tradition that the image Our Lady of the Snows appeared in that place. It was taken to the parochial church of Bagunte; it disappeared from the altar to be again found in the same location. After this had happened three times the faithful acknowledged that it was Our Lady’s will that that is where it was to be and they erected a chapel there giving it the name of our Lady of the Snows. We are in the field of pure legend. But, as there is no smoke without fire, and we must acknowledge that some reason must have existed to justify the building of the little church in a so wild a place. Anyway, the devotion to Our Lady which has developed there is not less genuine because there is no attested, historical information on its origin. Balasar is not very far from Barcelos and belonged to its municipality up to 1836. A word, then, on the Crosses of Barcelos. There are reports of the appearance of crosses in various places, over a long period of time. The case of Barcelos is one of the more notable. The Panegyric Treatise, written by a Franciscan, Friar Peter de Poiares, and published in 1672 speaks about them. The book is exactly that - a panegyric! The author is giving the crosses credit for the expansion and importance of the city since they appeared there. He is careful, of course, to attribute their appearance to causes with a convincing base in veracity. He was already sure Fr Leopoldino Mateus. One hundred years ago (January 1910) the little Alexandrina went to Póvoa de Varzim to frequent the elementary school. A costly experiment by the family and rural uprooting, but also by the difficult environment that the first months of the Republic were bringing to the town. The number of countries from where came in December visits to the Official Website totaled 119, a number never reached before. You are my victim, to you I have entrusted the highest mission. And as proof of this, listen carefully to what I say so that you will how to repeat it. 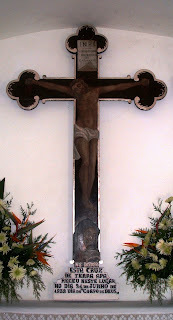 Almost a century ago I sent to this privileged parish the cross as a sign of your crucifixion. I did not send a cross of roses, because the cross didn’t grow roses, only thorns; nor was it of gold, because your virtues and your heroism would be the precious stones that would decorate it. The cross was of earth, because it was from the earth that the cross grew. The cross was prepared; it lacked the victim, but already in the divine mind it had been chosen; that victim was you. Evil has increased, the wave of sin has reached its high point, the victim must be immolated; you came, the world’s sacrificial lamb. And now you will leave earth for Heaven, but the cross will remain until the end of the world, and it will always be mine. It was human perversity that prepared mine, and it was the same human perversity that prepared yours. Oh, how admirable are the designs of the Lord! How great and admirable they are! How many delights they have! More than a century ago I showed a cross to this beloved land, a cross awaiting a victim. Everything is proof of love! Cross of earth for the victim who was taken from nothing, the victim chosen by God and who always existed in the eyes of God! The victim of the world, but so enriched with heavenly graces, who has given all for Heaven and who, for love of souls, accepts all! Trust, believe, my daughter! I am here. Repeat your "I believe". Trust! For some years after 1832, Balasar was place of pilgrimage to honour a Cross which had appeared mysteriously in the earth, a few meters from the actual church. To protect this Cross a Chapel, which still exists, was built. It has the date 1832 carved into the rock lintel of the door. During these years a Brotherhood was formed to promote a feast of the Holy Cross of Balasar. Little more than a century later, Balasar has come to be the object of numerous pilgrimages: the people are attracted by the fame of Alexandrina Maria da Costa, who lived here, "crucified", for many years. Those who came to Calvary asking the intercession of Blessed Alexandrina for some particular grace, invariably heard this advice: "Pray, I also pray". In this time, when in the traditionally Catholic countries the Church is not highly thought of, and people and institutions and governments, insist on straying from it; in this time when countries with no Catholic tradition are engaged in an absurd violence against Her; in this time when the crisis of priestly and religious vocations reach proportions of great severity, we must also rely confidently on our Beata: pray, as she prayed and continues to pray for us. It must be a program to be taken up by all at the beginning of this new year. I wanted to be born now, but to know already You, never to tarnish my body. I wanted, with me, to be born the whole world and that the whole world knew You too, so it was never tarnish. I wanted a new heart, that had always loved Thee to never stop loving You. I want the same for all creatures, so that they love Thee with the same love I desire for me. Where shall I hide myself and hide the world? Where will I purify myself and purify the world except in You?